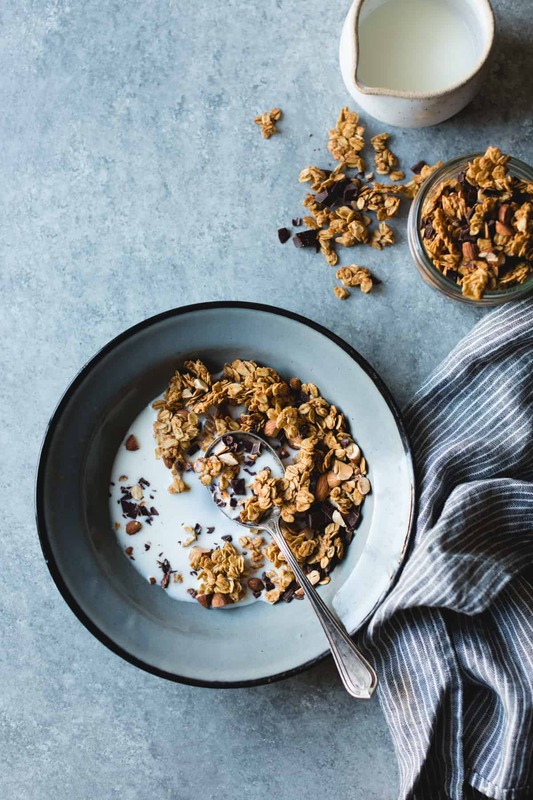 Sarah Kieffer’s crisp, gently sweetened granola tastes like a chocolate peanut butter cup in breakfast form. 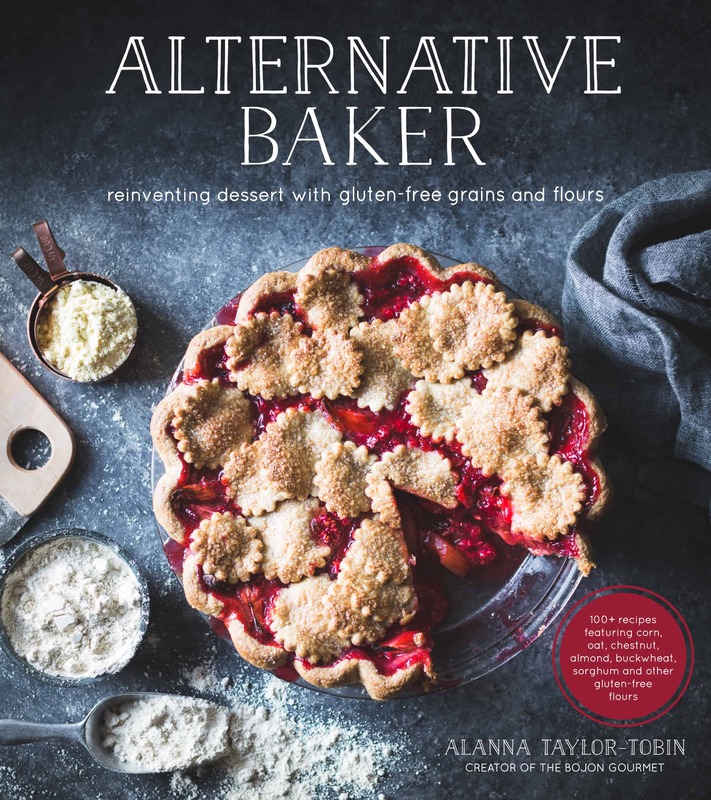 Adapted from The Vanilla Bean Baking Book: Recipes for Irresistible Everyday Favorites and Reinvented Classics. This has been a crappy year in too many ways to count, and (aside from today’s victory at Standing Rock), it just seems to be getting worse and worse. As difficult as it feels to sit down and write about a bowl of oats right now, I know that part of what will *actually* make America great again is supporting our fellow artists. One of those artists is Sarah Kieffer, the blogger, photographer, and writer behind The Vanilla Bean Blog. I’ve been a fangirl of Sarah’s innovative sweet treats, muted photography, and down to earth prose for many years. Her salty bourbon squares have made many appearances in my kitchen (in GF form), and it was a great honor to see the beautiful version of my vanilla butter cake from Alternative Baker with a boozy twist on her blog earlier this year. I was overjoyed when her book arrived in the mail. Page after page of Sarah’s signature sweets and soft images beckoned me to the kitchen. Pumpkin olive oil bread. Apple ginger skillet pie. Chocolate ganache cupcakes with basil buttercream. Cardamom cake with coffee buttercream. But Sarah’s intro to this granola caught me. 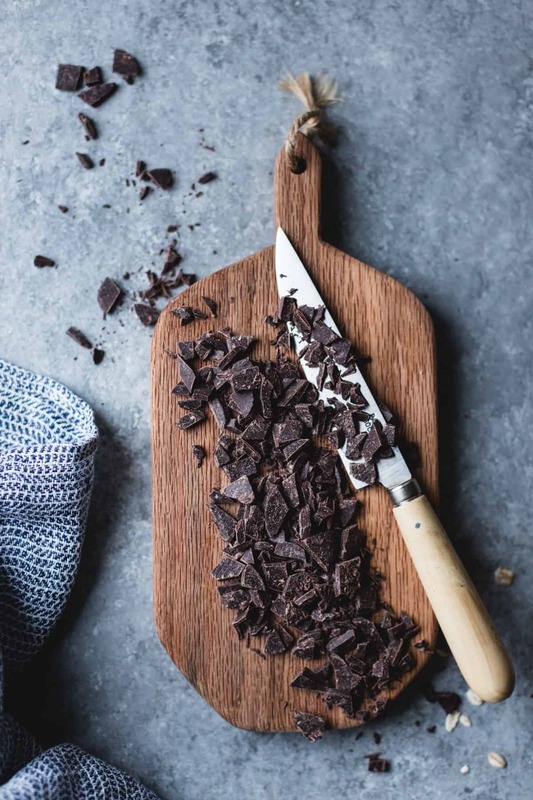 “I wake up every morning craving coffee… and chocolate.” Change “coffee” to “black tea with milk and honey,” and that’s me – I would gladly eat chocolate for breakfast any day. And that is precisely what we’ve been doing. 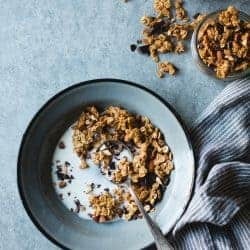 This granola is gently sweetened, flavored with just enough peanut butter to leave its mark, and laced with cacao nibs, toasted almonds, and chopped or grated bittersweet chocolate. It’s light and crispy, and works as well for breakfast with milk or yogurt as it does for dessert over ice cream or pot de crème. 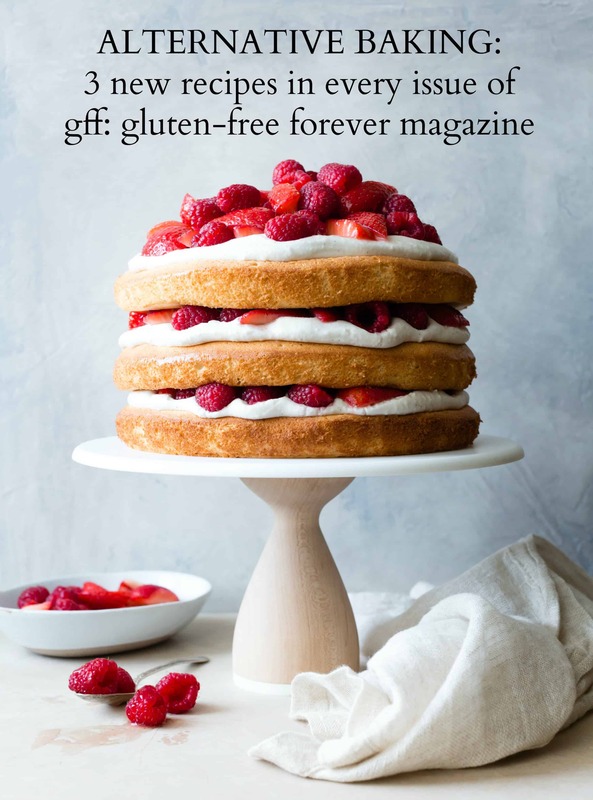 If you’re looking for a sweet (and highly glutenous) escape, pick up a copy of Sarah’s beautiful book. Speaking of books and sweets, I’ll be at Napa’s Bookmine at the Oxbow Market this Saturday December 10th from 12-2. If you’re in the area, I’d love to see you there! Adapted from The Vanilla Bean Baking Book: Recipes for Irresistable Everyday Favorites and Reinvented Classics by Sarah Kieffer. Place a rack in the center of the oven and preheat to 350ºF. Line a rimmed baking sheet with parchment paper. In a large bowl, whisk together the maple syrup, peanut butter, sunflower oil, water, and vanilla. Stir in the oats, brown sugar, salt, almonds, and cacao nibs, stirring well to coat. Spread the oat mixture evenly over the baking sheet. 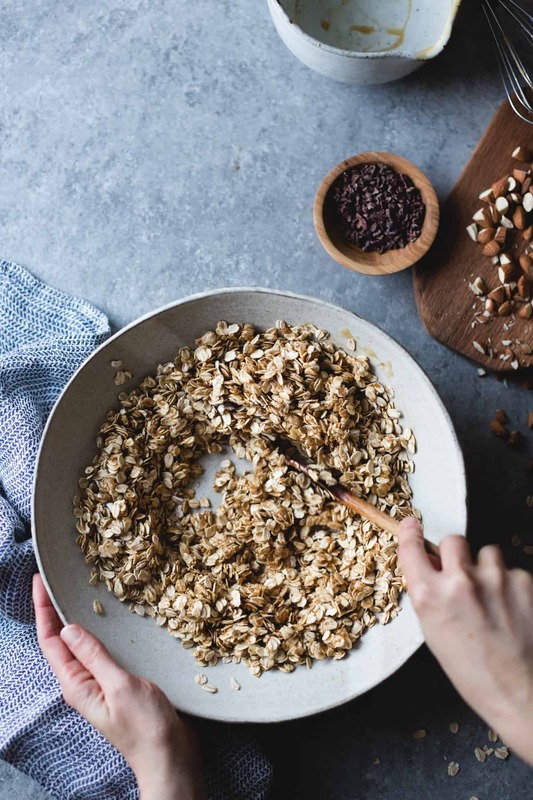 Bake the granola until the oats are golden and dry, 20-30 minutes, stirring it gently if the edges are browning too quickly (less stirring means clumpier granola so you might not need to stir). You can test the granola by placing a small spoonful on the counter; if it crisps when it cools, it's ready. Let the granola cool completely, then stir in the chopped chocolate. Store airtight at room temperature for up to 1 month. Enjoy with milk or yogurt, or over ice cream for dessert. Granola is just the best! I could eat is everyday probably! Count me in! 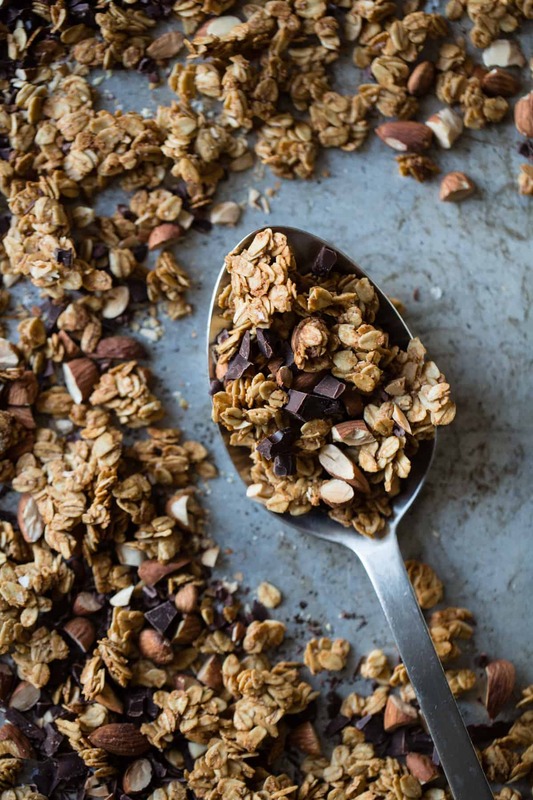 Chocolate is always the perfect finishing touch to a perfect granola and this one sounds divine! No doubt the Standing Rock news is the best we’ve had in months… but there’s so much more work to be done. Have you heard of the TransMountainPipeline (it’s not good, Alanna)? 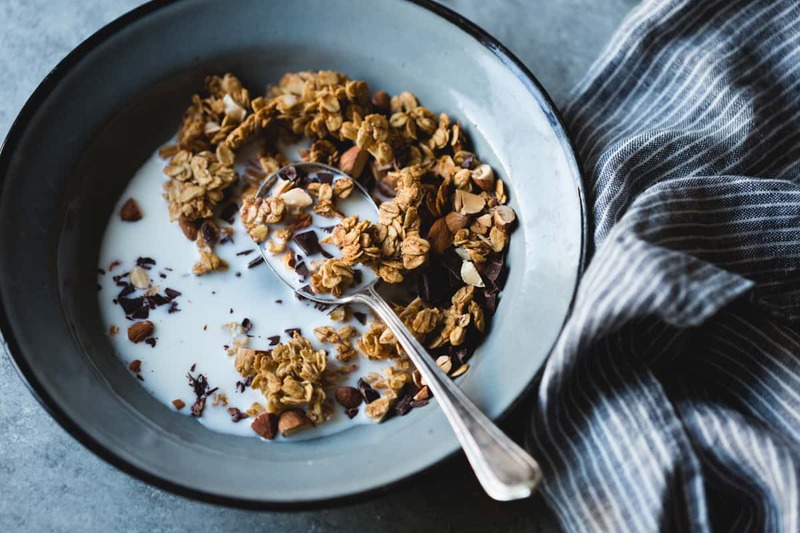 Perhaps this is why granola is a staple in our home… I can rely on it, it’s always good news, and it reminds me of good times. 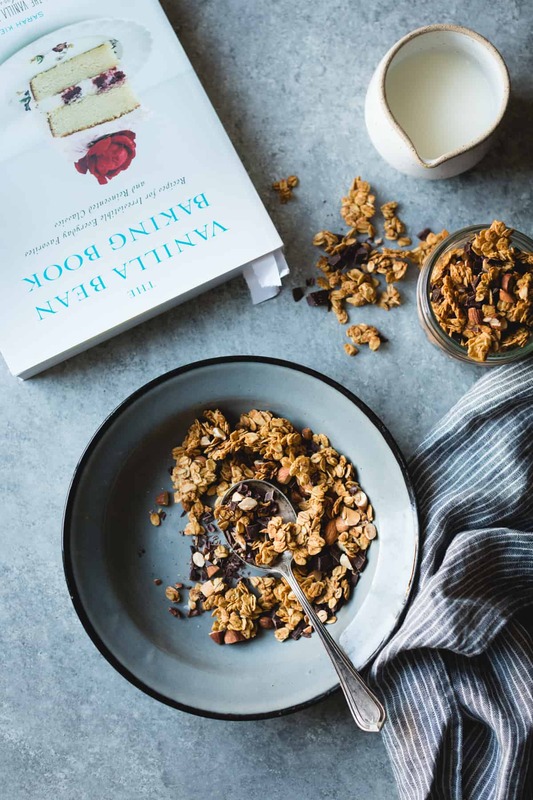 Sarah’s granola looks divine and I love the added chunk in there.. a win-win! I’ll be on the look out for her book. Thank you for sharing, Alanna! Hi Traci! Ugh, I hadn’t heard about that one but I’ll look into it. I heard an interview with Chairman Archambault who said essentially that while this IS a great victory, our work isn’t finished – it’s only just begun. There is so much more to fight for. Despite all the hard stuff going on right now, I like your take on things and honestly agree that supporting artists and makers is one of those small things that becomes big change overtime. 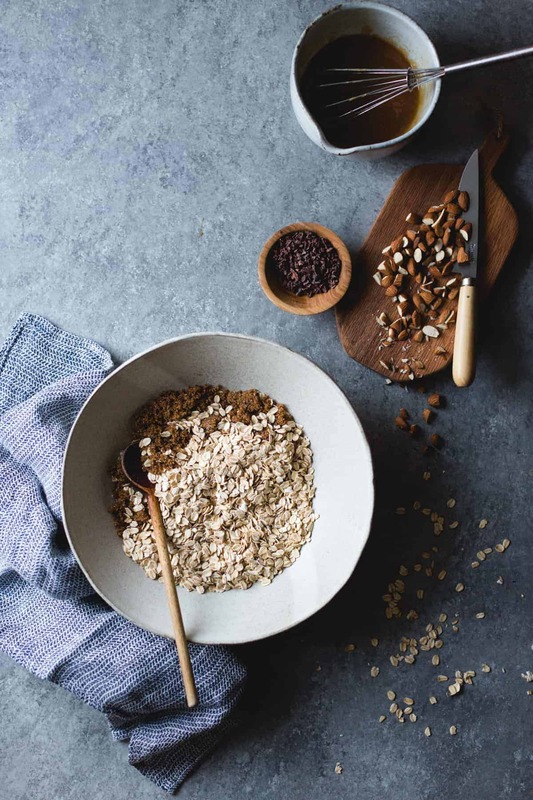 And in the spirit of the upcoming holiday season and the slightly more indulgent foods that come with it — THIS granola sounds perfect. YES! Support your local artist, blogger, cookbook author, musician…. People who make their livelihoods by making the world a more beautiful place. We’ve made granola several times but never with chocolate. Looks amazing! 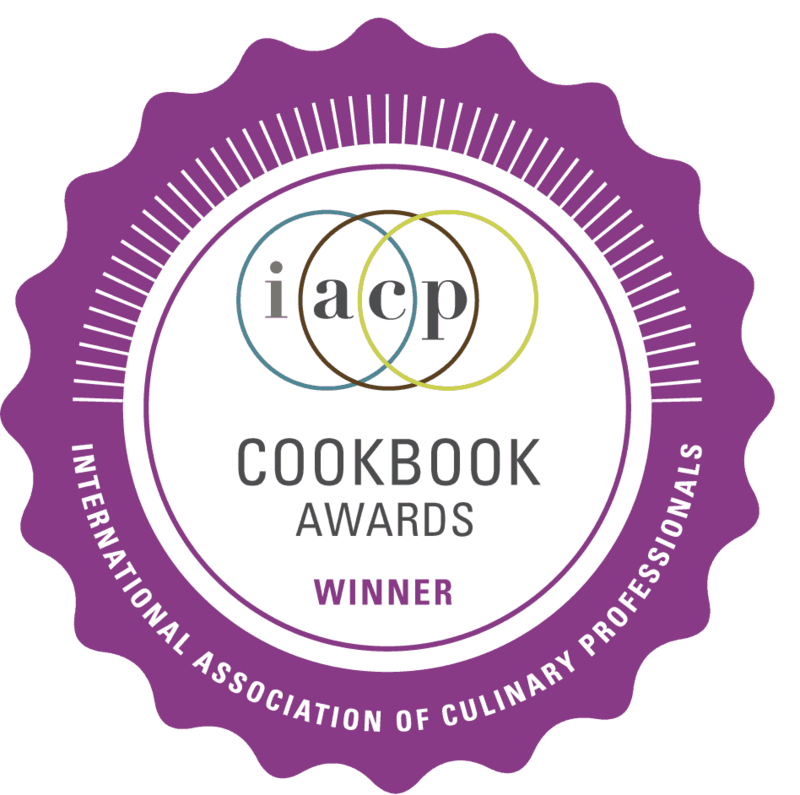 I am saving my pennies for your cookbook and Sarah’s cookbook. See, I have LOTS of cookbooks and I simply can’t get rid of them — they’re my friends. So, I space my purchases so hubby won’t complain that our house is being overrun with cookbooks :-( Hope your year improves. I hear you about the crappy year. I’m very happy about the Standing Rock victory, and hope it lasts (I understand there’s a really good chance the orange one will overturn it). Our treatment of the Native Americans is shameful, to say the least. I’m all for supporting our artists. And therefore will have to give this granola a try when I run out of my current chocolate granola. 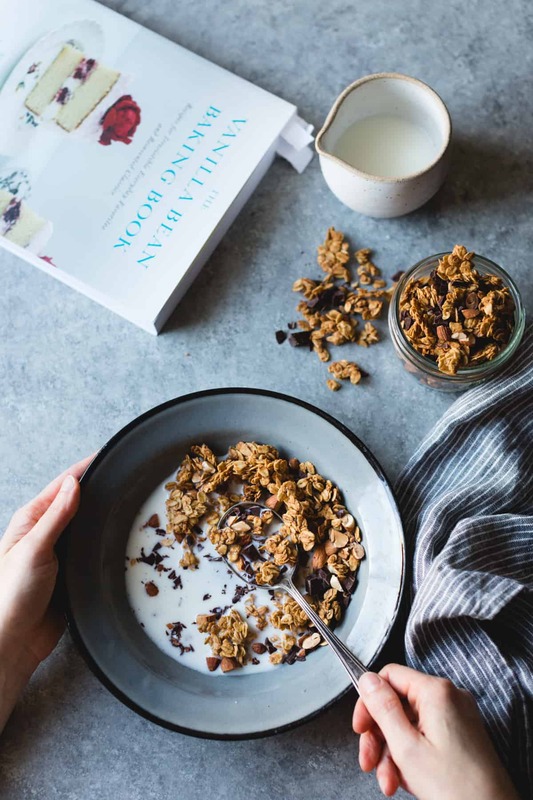 One of our very favorite breakfasts is a bowl of Greek yogurt with cocoa powder, a little sweetener, a little protein powder, blueberries, and chocolate granola. One is never too old to eat dessert for breakfast. Oh I am going to make this, I have all the ingredients in the cupboard and I really need a new breakfast alternative. I’ve been eating chocolate for breakfast too, thanks to you! I got to sample this (twice!) and can vouch for it’s deliciousness! It satisfies my breakfast chocolate craving:) Also these photos are so soft and dreamy! Can’t go wrong with having chocolate at breakfast! (Or at any time of the day). I made this recipe today – with almond butter instead of PB – and it was just heavenly. Thank you! My favourite people are going to get a jar of this from now on. Ooooh, I bet almond butter would be amazing! I love Sarah’s recipe and I’m glad you do too!